Born in Moscow, Lunkina trained at the Moscow Choreographic Academy, the Bolshoi's feeder school, before joining the Bolshoi Ballet in 1997. Lunkina stood out from the corps from the start with her expressive eyes and long arms and neck. In her first year with the company, at just 18, she was cast as the lead in Giselle—the youngest dancer in the Bolshoi's history to perform that role. To help her prepare both physically and emotionally, Lunkina was coached by the late Soviet ballerina Ekaterina Maximova, who herself had been coached by Galina Ulanova. Following her debut in Giselle, Lunkina's career blossomed, and even before being promoted to principal in 2005 she had already danced leading roles in Swan Lake and The Sleeping Beauty. As Lunkina rose through the ranks, Maximova remained her coach, until her sudden death in 2009. “She was like a mother to me," says Lunkina. In the meantime, Lunkina married and became a mother herself. Her husband, entrepreneur Vladislav Moskalev, is a dual Russian-Canadian citizen, and they have long owned a second home in the the quaint village of Kleinburg, Ontario, just northwest of Toronto. Their children, Maxim, 10, and Eva, 5, were both born in Canada, and Lunkina has permanent residency status. In 2012, she made headlines when she abruptly cancelled her performances, requested an extended leave of absence from the Bolshoi and retreated to Kleinburg. At a news conference, Lunkina told the media she feared for her life, saying: “I cannot go back at this time because there were actual threats." The threats allegedly stemmed from a dispute between her husband and his former business associate after a film deal went sour. Lunkina in rehearsal with NBOC principal Piotr Stanczyk. Photo by Bruce Zinger, Courtesy NBOC. Lunkina spent the next several months taking company class with NBOC before Kain invited her to perform with them. Luckily, Lunkina found the environment welcoming. “I never felt like a guest," she says. She was eager to work with NBOC artistic staff, and often watched rehearsals for roles she wasn't cast in, just to familiarize herself with the ballets and the dancers. While the company's eclectic repertoire is a departure from the Bolshoi's, it fuels Lunkina's artistic curiosity. Her eyes light up recalling what it was like to work with Canadian choreographer James Kudelka on his dark retelling of Swan Lake. In it, the Swan Queen is not a maiden but an actual swan. “With James, I had a completely different feeling, a new understanding of the role," she says, admitting she relishes the rehearsal process. “I was amazed at how he worked with the artists, how deeply he collaborated with them." Lunkina is also enthusiastic about the company's growing canon of contemporary works, describing her first rehearsal in Robert Binet's ballet Unearth as “amazing," albeit challenging. “Everything was so quick," says Lunkina. “It was a lot of information for the first day. Sometimes I need more time to work slower, deeper, and to understand every step—and sometimes you just have to do it." Her NBOC colleagues say that despite her Bolshoi credentials, she comes with no airs about being a prima ballerina. “There's no ego, just a really generous spirit," says Binet. “Even if I run out of corrections, she still has corrections for herself." Kain agrees. “She has no barriers to her approach," she says. “She doesn't edit what she likes or what she doesn't like. She just sees what the choreographer is asking and does the best she can do to fulfill that." Lunkina in Christopher Wheeldon's "Alice's Adventures in Wonderland." Photo Courtesy NBOC. During a rehearsal for John Neumeier's Nijinsky one afternoon last August, Lunkina kept to herself, breaking in her pointe shoes at the back of the room, while keeping an eye on the corrections being given to individual dancers. Even standing on the sidelines, her enviable facility and her smooth-as-silk quality of movement draw the eye. NBOC ballet master Lindsay Fischer notes that her Bolshoi training gives her extraordinary dynamic control. “The attack is different," he says. “You don't see the blade go in, it's so finessed." Although Lunkina is quiet, several dancers speak of her sense of humor and contagious laugh. “When she rehearses she has a joy about her—almost like a child who just started dancing," says NBOC corps de ballet member Andreea Olteanu. “Watching her reminds you why you started dancing in the first place." This season brings more new and challenging roles, including Romola, from Nijinsky, and the title role in Sir Kenneth MacMillan's Manon. 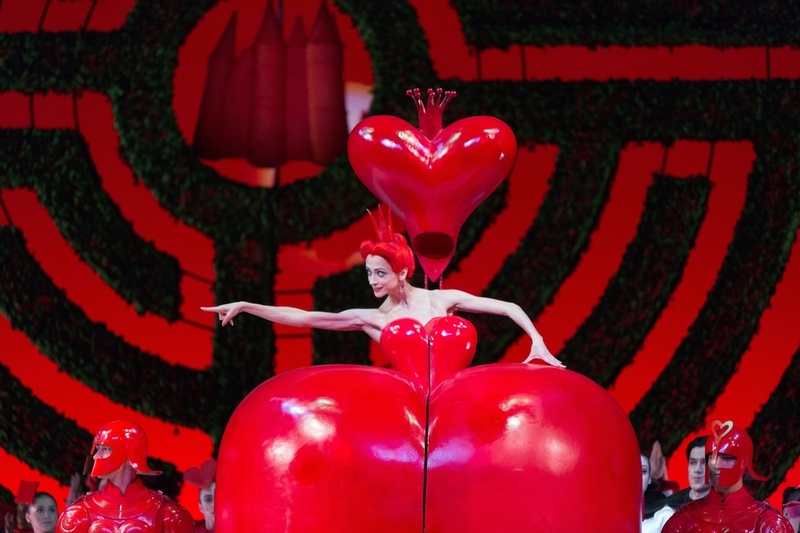 And last September, Lunkina made her debut as the wicked, over-the-top Queen of Hearts in Christopher Wheeldon's Alice's Adventures in Wonderland during the company's tour to New York City. “I think it was a huge departure for her," says NBOC artist-in-residence Rex Harrington, who played opposite her as the King of Hearts. “She had to work with it a bit. Comedy is all about timing, how you thread sentences together. It was fun to see her interpretation—it was different than everyone else's." Whether Lunkina will remain in Canada is anyone's guess—technically, she is still “on leave" from the Bolshoi, and her younger sister Yulia remains a soloist there. Right now, however, Lunkina says she's focusing squarely on what she calls her “new life" with NBOC. And when she's not dancing, her children take center stage. She's one of many working moms in NBOC and says family and ballet are equally important to her, and that her children are happy in Canada. “I just want to be in this moment," she says. “I don't want to think about the past or future. I just want to think about what I want to do with this company."